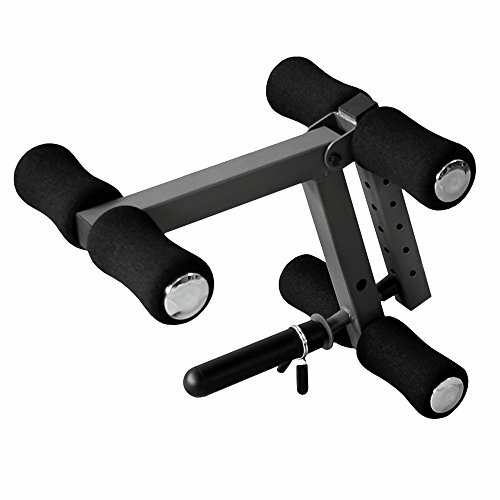 XMark's Universal 14-Gauge Adjustable Leg Curl/ Extension Attachment has six multiple height adjustments and six 8" x 4" contoured roller pads. With full range of motion, lying leg curls and seated leg extensions develop hamstring and quad muscles crucial to balance, speed and coordination. Designed for repeated, long term use, the leg attachment boasts a 200 pound plate weight capacity for use with Olympic or standard plate weights. The XMark Universal Leg Curl Attachment will fit any standard weight bench having a 2" x 2" receiver that pins front to back or side to side. Before purchasing, carefully review the photos to make sure the pre-drilled holes are in the same direction as your bench.